“The Elven Knight summons us to heed the call of Faerie. This is the male energy that can draw you deeper into the world beyond your own. Much of the energy in Faerie is female, but there is a true balance of male energy there as well. The Elven Knight, the consort of the queen, can rule equally in this land. 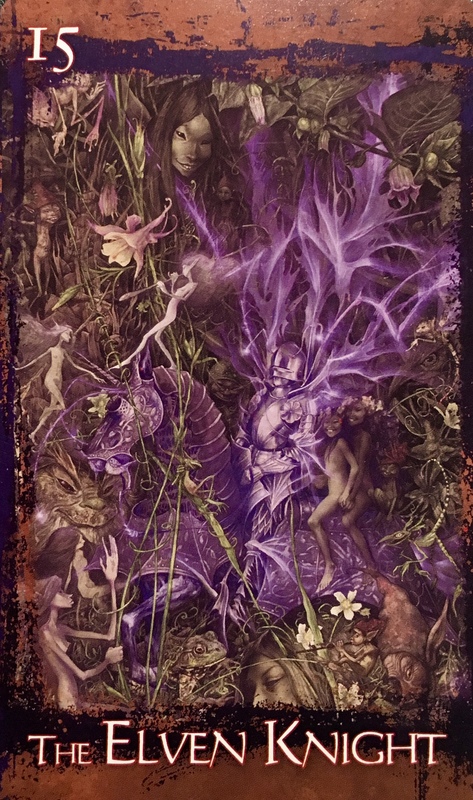 Proud and powerful, he rides through this domain, leading the faeries in a procession that can take them from their world into ours and back again. The trooping of the faeries is dangerous to witness, but the lure of it is almost irresistible, and we wish nothing more than to follow the call of The Elven Knight deep into his realm. The danger is that, once we have followed in the wake of the troop we will not want, or even be able, to return to our own world, and will instead be lost forever in the land of Faerie. The ego is always present and it may not be comfortable with you undergoing a Spiritual Transformation at this time, when you ‘should’ be worrying about more material needs. Work hard; pay bills; purchase items that show your status and worth; consume, attain, hoard… All under the supervision of ego. Think of the ego as Scrooge. Stooping low to make sure we rise to the top. Being wary of others as they may steal our stuff! Not trusting. Not sharing. Lack mentality. Fear. Suspicion. Worry. Doubt. And ego is warning you now, be careful! You may be forever altered by this so-called spiritual quest! Put it off for later. Get back to work! We need more STUFF!!!!! But that’s not going to work this time, oh no, that is a very old tape that has been playing for way too long. We are all done with that. In fact, there is quiet a lot we are done with now! There is also the chance that there is someone in your life who is comfortable with the idea of you becoming a more spiritual being. They like the old you, the you that they know, think they understand, and possibly feel in control of. This is going going to stop you from moving forward fearlessly, and in fact, it may be your first challenge to distance yourself from those who do not hold your Highest Good in mind, or who are intimidated by your awakening. Don’t worry, one day, in this lifetime or the next, they will figure theirs out. No one gets left behind, but everyone must get there on their own time. Do not let the fear of others hold you back from your Spiritual Quest. We are going to listen to the call of our hearts. We are going to trust in the Elven Knight to lead us safely through the enchanted forest and safely past the temptation to go back to the same old routine of acquisition. Instead, we are going to trust. We have Faith. We hear the call of ascension and we heed it. We decide we want to remember. We intend to be triumphant on our Spiritual Journey. We decide, right now, to Wake UP!